Prunus virginiana.John Lynch. Copyright © 2014 New England Wild Flower Society.gobotany.newenglandwild.org. (Accessed 9/2014). 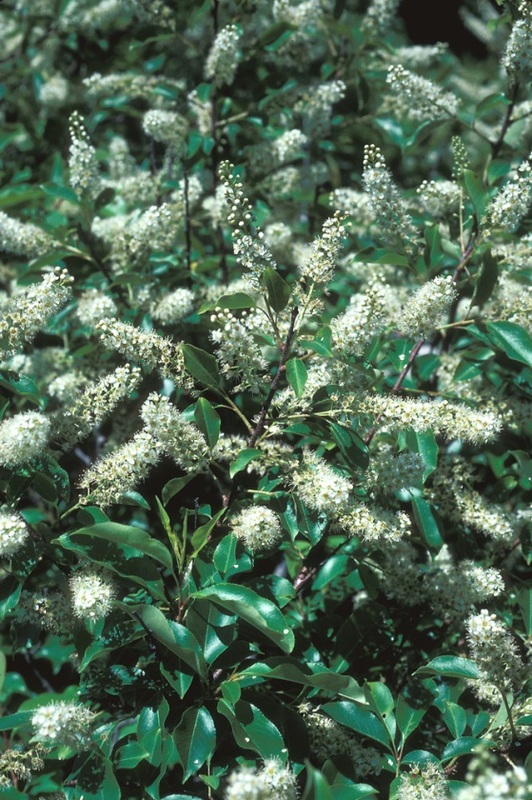 Prunus virginiana is a small, shrubby tree To 10 m tall; bark not aromatic. Leaves alternate, about 8 cm long, veins about 9 pairs, conspicuous, teeth sharp ascending, leaf teeth sharper and smaller than those of P. serotina. Flowers white, in racemes at ends of twigs, sepal lobes blunt, deciduous. Fruit dark red-black, astringent, pulp lipid <10% (White and Stiles 1992), eaten & dispersed by birds. Frequency in NYC: Very infrequent. Probably not occurring in NYC. Herbarium collections at Staten Island Institute or Arts and Sciences were recently identified these specimens as P. serotina (S. Clemants personal communication). Habitat: Open areas. Soil pH 5.2-8.4. Tolerant of fire, intolerant of shade (USDA, NRCS 2010).